Registry Workshop is an advanced registry editor. 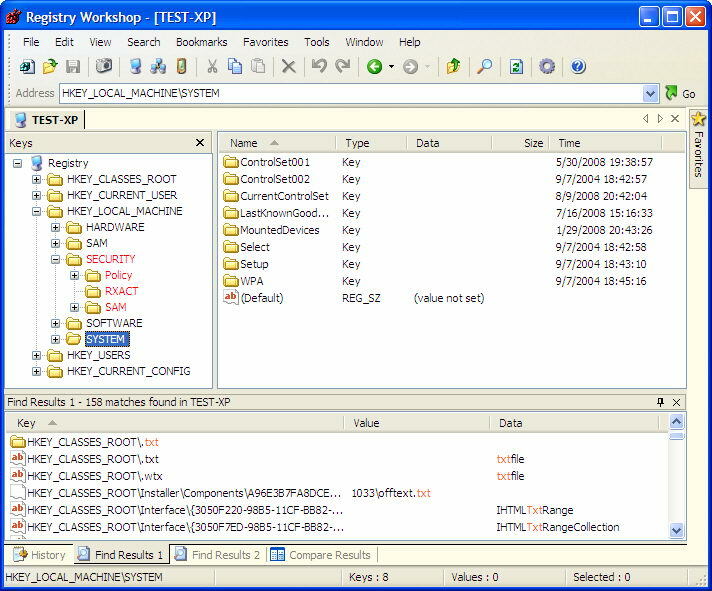 In addition to all the features that you can find in RegEdit and RegEdt32, Registry Workshop adds many powerful features that allow you to work faster and more efficiently with registry related tasks.In addition to all the standard features, Registry Workshop adds a variety of powerful features that allow you to work faster and more efficiently with registry related tasks. ...... company's PCs, or a software developer who needs to quickly manipulate registry keys and values during system development, Registry Workshop has the tools that you need. - Multiple undo and redo. The undo history can be saved to disk and reloaded at startup. - Search and replace registry keys, values and data with super fast search algorithm. - Compare registry between computers and/or .REG files with super fast speed. - Connect mobile device (Pocket PC, SmartPhone, etc.) registry via ActiveSync. - Cut, copy and paste registry keys and values. - Drag and drop to move or copy registry keys and values. - Edit .REG files and .POL files in the same way as editing system registry. - Backup and restore registry. - Defragment registry with preview. - Easy and flexible Favorites management. - Quickly browse registry with address bar, bookmarks and visitation history. Qweas is providing links to TorchSoft Registry Workshop 4.3.0 as a courtesy, and makes no representations regarding TorchSoft Registry Workshop or any other applications or any information related thereto. Any questions, complaints or claims regarding this application TorchSoft Registry Workshop 4.3.0 must be directed to the appropriate software vendor. You may click the publisher link of TorchSoft Registry Workshop on the top of this page to get more details about the vendor.